Ducati Multistrada - An acquired taste? When I first saw the Ducati Multistrada at the NEC a couple of years ago I said to myself "Now there's an ugly bike, what are Ducati doing by building that?" 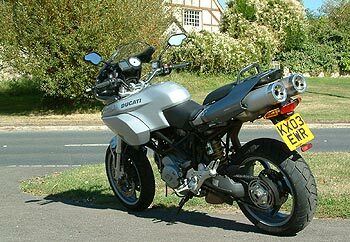 It is complete departure from the Italian exotica the factory is renowned for producing, in fact I would have gone so far as to say that it was not a Ducati design when I first saw it. But times change, and first impressions can sometime be completely wrong! Sometimes it takes me a while to make my mind up about a new bike when riding it for the first time. 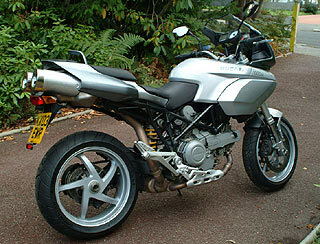 When I collected the Multistrada from Ducati I also collected a 1000DS which I started to ride immediately. It wasn't until about a week later that we swapped bikes over after being told by Simon "You've just got to ride this Multistrada It's just great, you can take so many liberties with it" so we swapped and I did! This bike is not just good, it's great, and seriously good fun to live with. It is so unlike any other Ducati I have ever ridden and I must say that I am very impressed with the end result created by Ducati's designers and engineers, it is after all previously unexplored territory for Ducati. 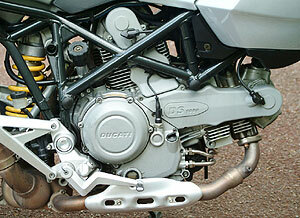 Director of design at Ducati, Pierre Terblanche, wanted to build a bike that was fun to ride on the roads he enjoyed. OK so that's a good enough reason, but the new bike had to cope with not only the twisting and often bumpy mountain passes, it also needed the ability to ride in town and tackle long-distance work as well. There are lots of winding roads in the mountainous areas of Italy, many of them are also rutted with breaking surfaces and strange repairs, much like the roads in the UK really! But it's on these types of roads that the Multistrada truly excels. 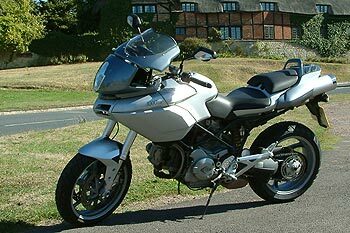 My first ride on the Multistrada was in fact on the pillion for some 40-50 miles, I found out then that it was indeed very comfortable on the back, and that the bike had plenty of grunt for some serious touring either with a pillion or with lots of luggage. We then swapped bikes and I took the quick route home to get out of London, the M25, oh well it had to be done! On the way back I took the longer way home and exited the M40 and off into the Oxfordshire countryside for some rather more serious riding. That's when I saw the Multistrada come into it's own. Having spent many a happy day riding these roads on all sorts of serious sportsbikes, tourers, customs and other strange bikes I suddenly saw the light! The Ducati Multistrada is possibly the ultimate all-rounder on these roads, it's so much fun to ride with it's perfect blend of sportsbike handling and performance with a high riding position akin to something like a 2 wheeled Range Rover. It is comfortable, has a great riding position, it's practical and when needed can actually do a little off-road work as well. The 1000 DS 'Dual Spark' motor that powers the Multistrada is the same variant that is currently fitted to the 1000DS Supersport, and the Monster. This new engine gives you effortless power and torque, it's not arm-wrenching but the way it fits in to the design and approach of the bike really lets you use all of it. There is a little vibration through various parts of the bike at certain speeds, but it's never that annoying, it's just enough to let you know you are on an Italian masterpiece. There's lots of torque available from just off idle, and it will rev up to 8700rpm redline easily in almost all of the 6 gears. In 6th gear at a leisurely 4000rpm you will see a legal 70mph which says that it is relaxed and has a serious potential as a tourer. The Multistrada rides on a signature Ducati trellis frame, it feels just right for the bike giving a solid feeling and perfectly rigid. The front end is fitted with USD Showa forks and the rear with a monoshock set-up as found on Ducati's 999 and 749, It rides with total confidence and gives you a grin every time. There are some differences in the suspension however, mainly the 165mm of travel, and also the compression damping adjustor has been re-positioned to the outside of the fork legs, this makes it so much easier to adjust over the other versions.The end result is that the Multistrada has sportsbike handling, can soak up potholes and ruts, and with the 24-degree steering angle has a near perfect balance of agility and stability on all roads. One thing I must say here is I am not used to any Ducati having a good steering lock, but to my surprise the Multistrada actually has. This together with a low centre of gravity make tight U-turns dead easy for anyone. The clutch is a little heavy, but then it just reminds you that you are in fact on a Ducati, it's not a problem in town or traffic at all. The gearbox is very good indeed, it is positive and slick around town, out on the open roads or even at a track day. Trackday? I hear you say, well yes is the answer. I think that this bike in good hands will seriously upset many a sportsbike, after all it has all the trademark handling qualities of any other Ducati. On other more sports focused Ducatis the injection system has a tendency to jerkiness around town, this was something I could not find on the Multistrada. The Marelli system is slightly different to the normal version and has no cold idle lever like the 1000DS Supersport or Monster. 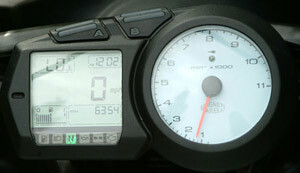 It is crisper to ride in traffic and has great response right up through the rev range. You can bring into play all those 84 horses to get the 200kg of Multistrada going in a flash. I suppose sometime in the future we will see a 998 or maybe a 999 powered version, that day will be fantastic if this bike is anything to go by! In the braking department Ducati have yet again set the standards for seriously good brakes, in fact the brakes fitted to the Multistrada are the same as you will find on the 999, 749, Supersports and so on. You get fantastic stopping power, great feel and tyre squealing from both ends. Of course they're Brembo 'Gold series' to be exact, need I say any more!! So after all the mechanical stuff what have we got here? Well on first impressions the Multistrada is not the best looking bike in the world, but it has character and that's what it is all about nowadays. To top that off the entire package delivers an adrenalin rush that most other bikes don't even come close to, it's user friendly and will take you almost anywhere you want to go. 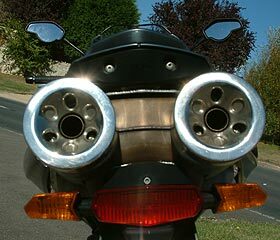 So don't be put off by first impressions, this bike has it all and it grows on you very quickly. The riding position and general feel of the bike is that of a slightly grown-up Supermoto, it's very slim, has wide bars and a low slung engine. Taking it around the lanes and 'B' roads is just a pleasure with the precise steering and linear power delivery. It's so easy to just sweep through corners and around long bends without a hint of any weave or deviation off-line, in fact all you have to do point it and that's where it will go. Quick changes of line mid corner didn't seem to pose any problems at all, a couple of Pheasants and a sheep can vouch for that! The riding position is just perfect and pretty comfortable as well. The low footrests give plenty of legroom and don't restrict the cornering clearance in any way. It has a seat height of 850mm so maybe some shorter riders will have a little difficulty with it's height, but with it's exceptionally low C of G there's very little high up weight to balance even on tip-toes. Although the bars are quite wide they are not a problem in traffic or when filtering, the Multistrada has a serious amount of steering lock and can get you out of a lot of traffic situations with ease, there's so much leverage and control of the bike with the standard bars and I for one would not want to change them for anything smaller, the only thing I would possibly change about them is the colour. Chrome bars on this bike just doesn't quite look right, I would like to see a set of high quality alloy bars fitted with a brace for that Supermoto finishing touch, these together with some hand guards from the vast array of Ducati accessories available for the Multistrada. Up top and in front of the bars comes the other modification I would make. The standard screen is just a bit low to give full protection, at normal speeds the windblast hits me right in the upper chest and starts to buffet you around at higher speeds. There is a higher version available from Ducati and would certainly be a must for any type of touring or motorway riding. Incidentally the top fairing/screen is in fact handlebar mounted and moves independently from the lower fairing, strange but true and it does take a little getting used to. Also on the subject of covering a lot more miles I would invest in the alternative seat from the accessory list due to the 'plank like' comfort of the standard one! It was never a problem on the ordinary roads as you tend to move around a lot anyway, but on longer runs when you are more still in the saddle it does get to you after a while. Everything about this bike is quite novel, from the overall styling to the funky mirrors and built-in indicators. They do look very cool but I can't help wondering why they are so small. Under the rear seat you have absolutely no storage space at all due to the fast that the exhaust cans are high mounted and there is a catalytic converter just where the storage should be, it does however keep the pillions rear end warm on winter runs though! Instead of seat storage you have a small lockable glove compartment in the right hand fairing panel, it doesn't really fit more than a wallet and a pair of sunglasses and the toolkit, but it's better than no storage at all. The quality of finish is absolutely typical of a modern-day Ducati, it's well put together, is fitted with some of the best available parts in the biking world, it has so much style and some seriously trick instrumentation, it really makes you feel like you are aboard a very special machine. If you are not convinced by now then I suggest you get down to you nearest Ducati store and try one. Apart from the initial looks, and getting used to them its a fantastic package. Personally I think it looks great from all sides, and has tons of character. Take a look at the Ducati accessory catalogue for the Multistrada and kit it out with carbon and performance parts, yes they are all available for this bike, just like it's Supersports brothers. But that's where the difference ends, get some panniers, engine guards and some other off-road type stuff and you will have a serious alternative to the BMW1150GS Adventure that will shock almost every sportsbike rider on the road! As designer Pierre Terblanche says, "What is important is that it doesn't pass unnoticed - it must be striking, it must stand out in the crowd, and it must work extremely well." Well in the case of the Multistrada they have certainly achieved that. The factory have created a bike that re-defines how people perceive Ducati, and to those customers who buy one I'm envious of you, I certainly would love one of these bikes.